Every real estate market creates its own buyer and seller personas, or profiles. When the market is slow and prices are low, it brings out the ‘wheeler-dealer' and the ‘low-baller’. But sellers aren’t immune to the same issues. In a warm or hot market real estate climate, the rise in home prices makes some sellers wonder whether they should exercise the freedom of finally having some home equity and make a move, or if it's a better idea to stay in hopes they can sell for more, next year or later. Truth is, whether any given person should sell their home or stay at any given time is a highly personal decision. Market dynamics should defiantly come into play however that should be considered in the context of your personal life, career, family and financial plans. Trying to figure out whether to sell or stay? 1. Sign You Should Sell: You frequently crave a neighborhood upgrade. I have known people who have lived in “up and coming neighborhoods” for 20 years, and are still waiting for it to up-and-come. Others own homes on streets or in subdivisions they used to love that have changed dramatically because the city has been built up in a different direction, the area was rezoned, or because a school, freeway, commercial development, airport or train station was brought in. And still other home owners fall out of love with their neighborhoods because their job has moved, making their commute a pain. In any event, if your home’s location is seriously misaligned with your life or your tastes, that fact is one you face all day, every day, for the duration of the time you live in the property. It can become a serious source of life dissatisfaction and resentment that rears its ugly head every time you make your monthly mortgage payment. As I see it, dissatisfaction with your neighborhood or a serious neighborhood-life disconnect can be a strong reason to sell and move, assuming you can make a move to a neighborhood that would better serve your life in a financially responsible way. 2. Sign You Should Stay: You can totally afford a new house - if you sell a kidney. We all know that person that is so addicted to the grass-is-greener promise of moving to a new home that they actually take their family Open House hunting, even when they are visiting towns they have no interest in moving to! They go on with their inherited real estate addiction to the national trend of “moving on up,” so to speak, with financial recklessness - the trend that many believe played a large part in the Great Recession. 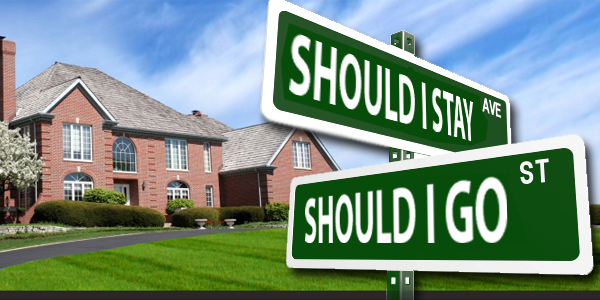 There’s nothing wrong with being a real estate aficionado, but it’s important to watch to make sure grass-is-greener-at-that-house syndrome isn’t motivating you to make a financially unwise decision to sell and move. If you are considering selling your home and moving up, do your own ‘financial home work’ first. Run your own budgets, income, expense reports and other financials to understand what level of increased financial obligation, if any, your household finances can afford to take. Consider whether you might want to set up some savings, investing or debt elimination targets before making a move. Work with your financial planner, tax professional, your real estate and mortgage pros to fully understand all the financial implications, short- and long-term, of selling and moving before you put the sign up in the yard. I marvel at how much stuff the smallest infant seems to need. I once went to a baby shower that generated so many strollers, packable playpens and sheer gear that it took 2 SUVs and a station wagon to cart it all home - for a kid that ultimately weighed in at 6 pounds and some-odd ounces. If you have very young children and you’re already tripping over each other, chances are good that their space needs will grow as they do, even after all the baby gear is gone. School-aged kids and teenagers develop their own hobbies and need space for studies and sports - and on top of that, many parents of young children can realistically anticipate moving their own parents in at some point in time. 4. Sign You Should Stay: You could fix what ails your home with relatively modest remodeling projects. If your home is bothersome primarily because things don’t function very well or its aesthetics are out of whack with your style, you might be tempted to sell and move. Here’s a tip-off: your “dream home” is the Open House one block over that is nearly identical to your home in location, size, architecture, bedrooms and baths, but is impeccably decorated and updated. If you find yourself in this situation, you might very well be able to resolve your issues by investing less than you would spend on the transactional costs of selling and buying another home into some small-to-medium-scale remodeling projects on your current home. Ask yourself these questions and if the decision is to sell… Call the Big Man!